September 30, 2011  TV critic David Bianculli says most shows on TV this fall are a big disappointment. But three offerings this upcoming Sunday night — Prohibition, Dexter and Homeland — are all excellent, invigorating and exceptionally intelligent. September 29, 2011  Claire Danes' latest role has her hunting terrorists in the Showtime series Homeland. Troubled CIA analyst Carrie Mathison believes an Iraqi war hero might be part of an Al Qaeda plot. Danes explains why the role appealed to her, and what she hopes the series can accomplish. September 29, 2011  Television's obnoxious relationship with femininity is legendary. But with tonight's launch of CBS's How To Be A Gentleman, it demonstrates that its relationship with masculinity may be even worse. September 28, 2011  ABC's Suburgatory seems like a cardboard cutout show about how the city is cooler than the suburbs. But at its heart is a well-articulated relationship between a loving dad and his wary daughter. 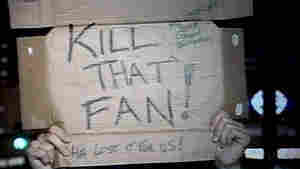 September 27, 2011  ESPN Films uses sports documentaries to look at mass culture, and tonight's Catching Hell, about Cubs fan Steve Bartman, presents a terrifying story of mass hysteria and media goading. September 26, 2011  We can begin to discern a few things about the new fall season. Comedies — both old ones and new ones — are coming on strong, aging reality franchises are flagging, and NBC just keeps trying to figure it out. September 23, 2011  Commentator Sarah Ventre says that the biggest problem with last week's Emmy Awards wasn't how lacking they were in cultural diversity, but how little she saw that problem discussed. September 23, 2011  The Office has officially started its first season without Steve Carell. A new boss, a new star, and some old-fashioned physical comedy contributed to a strong Thursday night return. September 23, 2011  Fans have been following the drama of Pine Valley — the fictitious Philadelphia suburb where the show takes place — since 1970, and much of that drama has revolved around Lucci's character, Erica Kane. But her reign comes to an end Friday as ABC airs the soap's final episode. September 22, 2011  Georgia executed Troy Davis Wednesday night for the shooting death of a police officer, despite widespread opposition to the execution and Davis' innocence plea. A Pulitzer Prize-winning journalist's new book says the Obama White House was a hostile workplace for women. And Dominique Strauss-Kahn confesses to "moral failing." The Beauty Shop women weigh in. September 22, 2011  Ted Danson and James Spader join the casts of CSI and The Office this season — and Simon Cowell returns to TV with an Americanized version of his British hit The X-Factor. Critic David Bianculli says the three TV vets each bring something else to their roles: a likability factor. September 22, 2011  The new Charlie's Angels isn't just a bad show. It's a show nobody even wants to be good, and that's what makes it so depressingly, offensively bad. September 21, 2011  Critics laud the British crime series Prime Suspect for paving the way for smart television roles for women. NBC's remake stars Maria Bello as the strong-willed detective Jame Timoney. Bello talks about her role and what she hopes the remake will bring to American audiences. September 21, 2011  Simon Cowell of American Idol fame is back on Fox with the debut of The X Factor. On NBC, two new shows air for the first time: Free Agents and Up All Night which stars Christina Applegate and Will Arnett. David Greene talks to Kim Masters of the Hollywood Reporter, and she also hosts The Business on member station KCRW. September 20, 2011  For decades, tourists have come to Los Angeles from all over the world to go on "star tours," where they could drive past Grauman's Chinese Theatre or get a glimpse of a favorite celebrity's mansion. 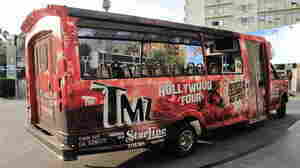 But in the new world of 24-7 star-filled gossip, a new TMZ tour bus has stepped up to the plate.